Q: Do you know the best way to calm your pre-interview jitters? A: Practice answering the most commonly asked interview questions so you will appear as calm, cool and collected as possible. A thirty minute interview isn’t a lot of time to showcase all of your experience, skills, ethics and affiliations – so make every minute count. Preparation is the key to a great interview and with practice, you will be able to answer some of the most commonly asked questions with poise and insight, which will make you appear knowledgeable, professional, and ideally, the best candidate for the job. Keep in mind that interviewers tend to focus on open-ended questions, allowing you to elaborate with past experiences or details relevant to the topic. While that gate is left wide open for you to direct the conversation, keep in mind that your answers need to be focused and free of unnecessary tangents. Most interviewers will ask similar questions, and it is important to practice commonly asked interview questions. Many of the common questions will be about yourself, your strengths and attributes, your experience and your interests. Tell me about yourself: Usually one of the first questions asked, it serves as a way to commence the interview and allows you to talk about yourself in a positive and professional way. Keep in mind that this is not an opportunity to talk about your personal life. Summarize where you stand in your career, related skills, facts about your education, and anything you think would help the interviewer receive a broad introduction of who you are professionally. Keep the answer to around a minute long. You will have more time to go into detail with this answer throughout the interview. Why do you want to work at this company? Adequate research on the company will help you answer this question effectively. Focus on what most interests you about the position, and be forward-thinking in your answer. Highlight positive career plans that fit in with their mission. Memorize their mission statement and express why you feel you would like to be a part of it. Try to avoid talking about benefits, salary and other topics that would be unrelated to the actual work you will be doing in your job. Be aware of your body language to ensure you are coming across enthusiastic to work at their company. Interviewers often sprinkle in a few tricky questions that may slip up other candidates during an interview. These questions can make or break an interview, so make sure that when you answer that you are being appropriate, professional and honest. Why are you leaving your job/why did you leave your last job? This can often be a trick question if not answered right. Often interviewers will use this question as an opportunity to rant about their previous employers. Never say anything negative about a previous company or the people who worked there, as this can often come across to the hiring manger that you would do the same to them. Many applicants answer this question by saying they are seeking new opportunities and challenges, looking to grow or expand, etc. Make sure you are able to be specific, but positive as you answer. What salary range are you looking for? Too many job seekers are not prepared to answer this question and are often caught off-guard. The question can seem like a lose-lose situation because aiming too high or too low can cost a lot. Research the market rate for the job ahead of time and negotiate well for yourself. Though certain hiring managers will differ on how to answer this question, the safest way to answer is to be confident and honest. If you must give a number, tell them what you think you are worth that's in the range of their payment. If they didn't think you were worth paying for, they wouldn't have asked you to come in. Some companies prefer to ask behavioral questions instead of questions related to skill. These are often the hardest questions to prepare for because they are so varied and depend on ethical choices in situations that you may or may not have had to deal with yet. What assignment was too difficult for you? How did you resolve the issue? If I were your supervisor and asked you to do something you disagreed with, what would you do? Tell me a time where you had to deal with conflict on a job. What is your greatest failure and how did you learn from it? Though these questions are not as fun because they highlight the not-so-pretty aspects of ourselves and future employment, it is important for the hiring manager to understand how you handle conflict. 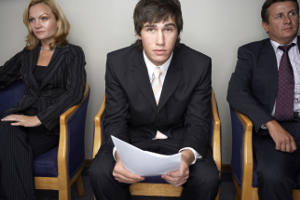 More and more employers are wanting to hire people with good interpersonal skills. By explaining a situation in which you overcame or handled conflict correctly, you will be able to answer the question in a way that will detail your conflict-resolution skills with the hiring manager. Unfortunately there is no way to know exactly what you may be asked during an interview, but with preparation you will be much more likely to land the job. Practice interviewing with a family member or friend using the questions in this section and then branch off, asking your pseudo interviewer to come up with their own questions. Remember that even though you can’t know what will be asked, you can be prepared for any interviewer. Always make sure that you have a few questions ready for the interviewer as well. This shows that you have done your homework and are enthusiastic about the position. Preparing for the interview may be difficult at first, but by researching the company, rehearsing sample questions and performing mock interviews, you will be more prepared and confident. Preparation and confidence is a large portion of what the employers are looking for.